Lunch and Dinner in all places. Start tour. 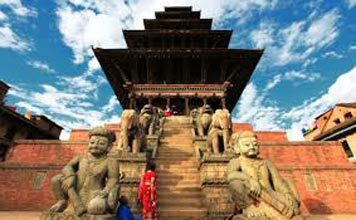 You will be received by Bengal Tourism/Local Representative on arrival at Kathmandu at TIA airport Kathmandu or Kalanki Bus stand, Kathmandu - At an height of 1400 meters / 4600 feet lies the central region of Nepal - Kathmandu valley - transfer to hotel ½ an hour drive. Overnight stay at Kathmandu. After breakfast, full day sightseeing Kathmandu - PASHUPATI NATH TEMPLE - 5 KM east of Kathmandu city centre. Pashupatinath Temple is one of the most important holiest sites for Hindus all over the world. BOUDHA NATH STUPA -05 km east of central Kathmandu. The stupa stands on a three - tiered platform raised over the crossed rectangles in order to bring the Yantra form. SWAYAMBHU NATH STUPA - 04 km west of central Kathmandu on a little hillock & KATHMANDU DURBAR SQUARE - heart of the Kathmandu city- local name of this area is Hanuman Dhoka - an ancient seat of the Nepalese Royalty. The Royal palace during mediaval times used for Royal Activities, Center of Administration, Cultural Activities and Festivals. Back to hotel or drop to market; back to hotel from market yourself. Overnight stay at Kathmandu. After breakfast full day sightseeing Patan & Bhaktapur - PATAN DURBAR SQUARE - 5 KM south of central Kathmandu, across the Bagmati river. This city founded in 3rd century A.D by King Veera Dev. The monuments in this square date back to the medieval Malla period from 16th to 18th century. BHAKTAPUR DURBAR SQUARE - The City of devotees ‘Bhaktapur’ was founded by AnandDev in 1197 A. D. The existence of the city could be traced back to the Lichavi period (185 - 750 A.D.), according to the Gopal Raj Vamsabali. The present structures were erected from the 12th century to the 18th century. The Durbar square was the seat of the Malla kings located at around 12 KM away from the Kathmandu city. NAGARKOT - located 32 km east of Kathmandu, in Bhaktapur District. At an elevation of 2,195 meters, it is one of the most scenic spots for its sunrise view & Sun set view of the including Mount Everest as well as other snow-capped peaks of the Himalaya range of eastern Nepal. Nagarkot also offers a panoramic view of the Kathmandu Valley. Back to hotel. Overnight stay at Kathmandu. After breakfast, transfer* by air/ground from Kathmandu to Pokhara. On arrival, transfer to hotel in Pokhara. Evening free. Overnight stay at Pokhara. (Alternative option) Drive towards Chitwan & Mankamana by road transfer. Overnight stay at Chitwan. After breakfast - Proceed by road towards Pokhara from Chitwan (or) half day sightseeing at Pokhara - Davis Falls, Gupteshwor Mahadev temple cave, Tibetan handicraft centre, Goddess Bindyabashani Temple, Seti river gorge, Mahendra cave , (duration nearly 04-05 hours) & Tal Varahi Temple. Overnight stay at Pokhara. 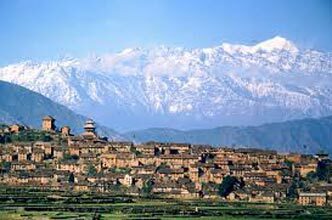 Early in the morning 4 - 4.30 AM departure from hotel, drive up Sarangkot hill & a few minutes walk to observe a stunning view of Sunrise over snow caped mount Fish Tail & mount Annapurna range (duration about 02.30 hrs). Back to hotel.After breakfast, hotel check out for departure & transfer to airport at Pokhara towards Kathmandu by air (or by road). On arrival, transfer to hotel at Kathmandu. Evening free.Overnight stay at Kathmandu (or) Proceed towards return journey. Early morning breakfast. Departure transfer to TIA Airport Kathmandu forwarding / return journey. Tour ends.